The Village Idiot is back to discuss and hopefully shed some light on a particularly odd phenomenon associated with the common holly-freaking-cow-that's-huge cockroach. But first, I would like to dispel what appears to be a popular misconception. Roaches do not have ears. I am convinced that many of you think otherwise judging by the shrill, piercing scream you emit that makes neighbors think you have just lopped off your toe. No matter what you may think, simply trying to scare the diddley-filth out of the cockroach in hopes that he will flee back to Congress a very dark place actually has little effect on said roach. Sure, he may stop to take the previously-mentioned diddley-filth, then smoke a cigarette... But after that he will carry on with business as usual. At best, the sonic vibrations from your scream will cause the poor fella to think there is an earthquake, panic, and run for the first safe place he can find. This will likely be up your pant leg, which leads to a situation where you have your neighbors coming over to help reattach your toe, and they find you laying face-up on the floor, flailing your leg, stripping off your pants, and muttering profanities. If at this point you are considered to be either, (a) one of 'those' people, or (b) having a seizure, you have only yourself to blame. In truth, cockroaches are rather timid little creatures and always do their best to accommodate you. If you don't believe me, consider how they scurry to get out of your way when you open a door or flip on a light. Consider their frantic nature as they scuttle around, hurrying to get off you when accidentally dropping from the ceiling. Clearly, they wish you no real harm. 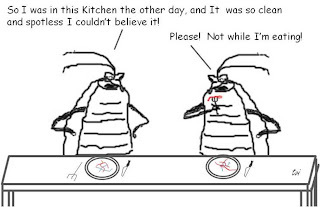 For the most part, roaches are a lot like men; they hang around the kitchen looking for food - or in the bathroom doing who knows what- and only scatter when the housework begins. However, the one aspect that is contradictory to their general good will (cockroaches, not men) is that they seem to have an overwhelming compulsion to crawl out into the middle of the kitchen floor to die. You see, doing this is unnatural. Cats, for instance, will crawl to the deepest, darkest part of the underside of your house to die in the moist, solitary darkness. In fact, any attempt to remove a not-yet-dead but dying cat from the confines of their "resting place" will progress about as pleasantly as a woman giving birth to an elephant. If you don't believe me, try it. After you retrieve your fingers from their Wolverine-sharpened claws and accept that you will never use that hand again, don't say I didn't warn you. There must be some reason, then, that a holly-mother-of-crazies-I-didn't-know-they-could-be-that-big cockroach chooses to die in the open. And the reason is quite simply arrived at by pushing our "roaches are like men" analogy a bit further. Like men, they simply get a kick out of grossing you out. Now pull my finger! No ears? Consider my world upheaved. Next you'll tell me my screams to nothing to dissuade snakes, either. > cherry topping on an already fabulous dessert! > nothing to dissuade snakes, either. > BugginWord said: *do* I hate typing. Ha! As do I... As do I. But all grammatical errors and typos are considered an official part of the village dialect. I consider that policy to extend to comments I make elsewhere, where apparently, I can't figure out how and where to properly hit the "enter" key or even bother trying to spell... Sorry bout that, btw. I seriously can't help it - I try & be a good role model and stuff for my daughter when I encounter a roach, but I always end up screaming at some point. I'm ashamed to admit that one time I even jumped up on the top of the coffee table, just like a cartoon character. 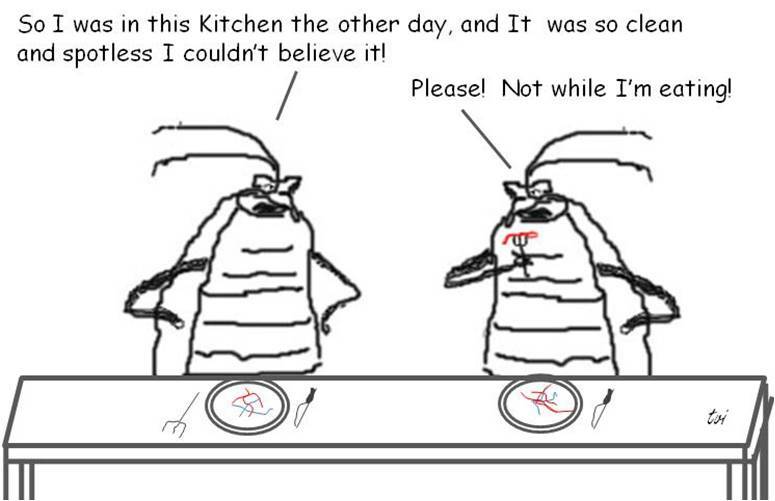 But I do think that the roaches turn out to be more polite though. Dying out in the open at least means there's not a bunch of rotting insect guts decaying inside the walls. My mother did that once when a wee little mouse came by. Up to that point, I really thought those cartoons were just relying on extravagant exaggeration. ツ <-This is my new favorite smiley face. I worked for a few months at a children's nursery (wayyyy back in the 1970s) and there were roaches there. The kids referred to them as 'piders. To them, everything was a spider. Probably me, too. My sister had a deep phobia of spiders growing up. She once chased me around the house holding one of those disgustingly large grass hoppers - but when it came to spiders, all bets were off. We once played a little joke by strategically placing plastic spiders all around the back of the car. They didn't look anything like real spiders, and Mom and I just thought we'd get a "haha very funny" once she noticed them... but oh my, she nearly had a heart attack! Delighted to see you working your way through! But I do feel sorry for anyone that has to suffer through that. :) You deserve a medal for this!